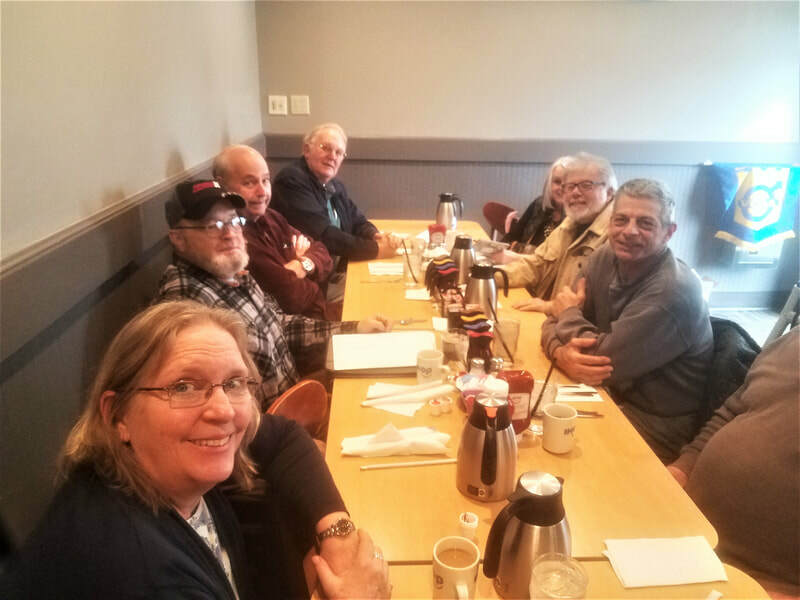 March Chapter Meeting IHOP S.Portland ME. 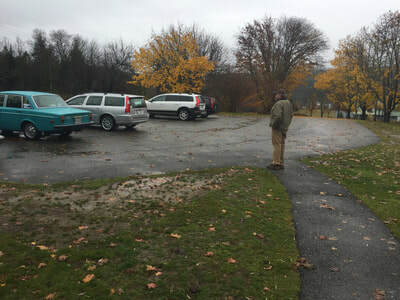 Our 2nd Annual Fall Foliage Tour was held on Saturday 11/2 despite several logistical impediments​....a reschedule, "no local restaurants" and weather that seemed to eternally dampen our spirits... Our group of nine members departed Augusta at 8:30 arriving in Belfast at 9:30 for a quick respite and or a late (quick) breakfast (Mickey D's)..departing again at 9:45 for a rendezvous with another chapter member on Water St. in Ellsworth, whose (local) directions and help were invaluable (Thank You Paula !!). 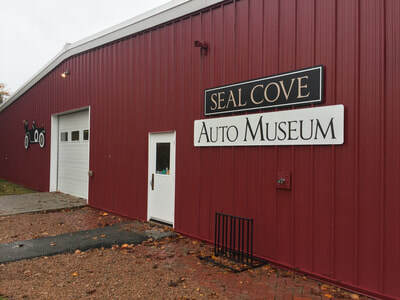 When we arrived at the Museum around 11 AM, it was still raining and a bit breezy but once inside the two gentlemen who greeted us and did the intro, made us feel like we were the only ones there (we were!). 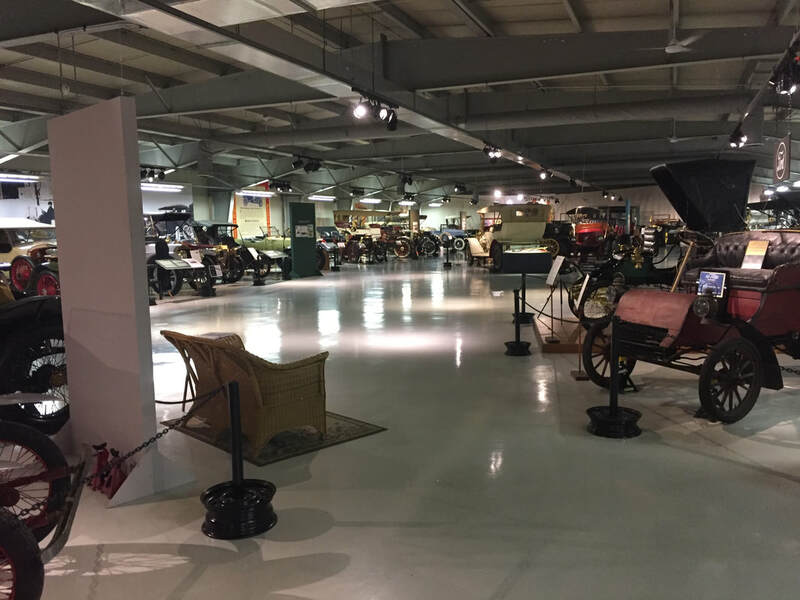 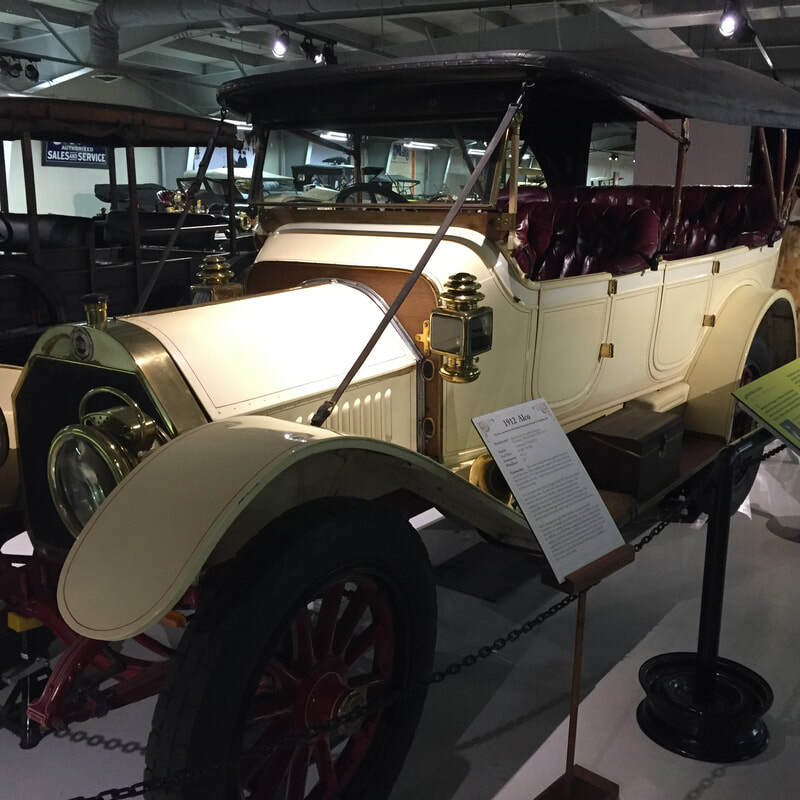 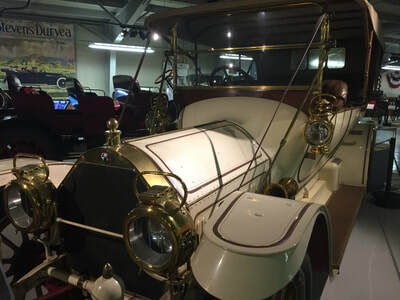 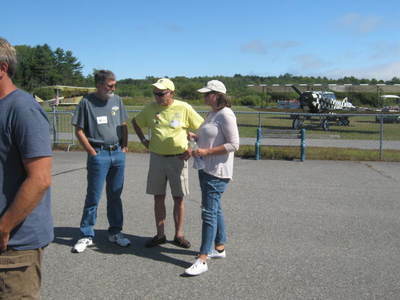 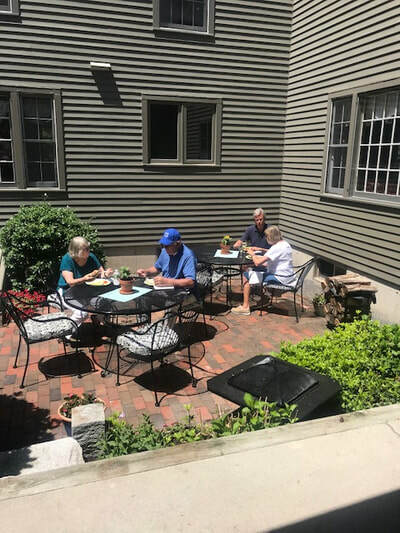 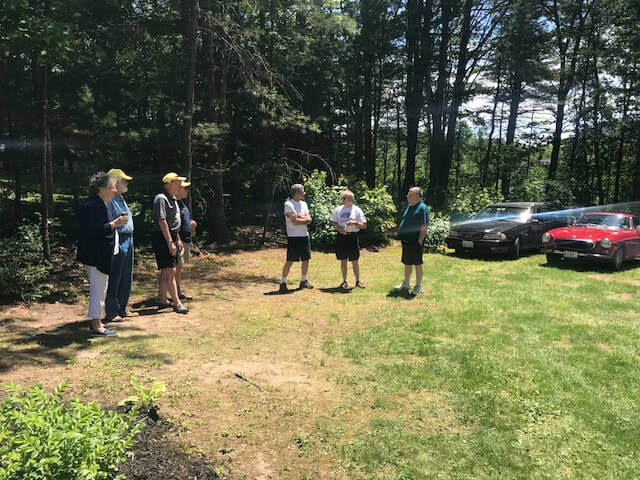 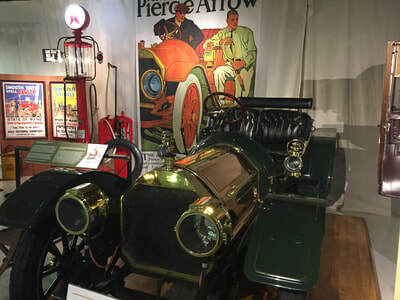 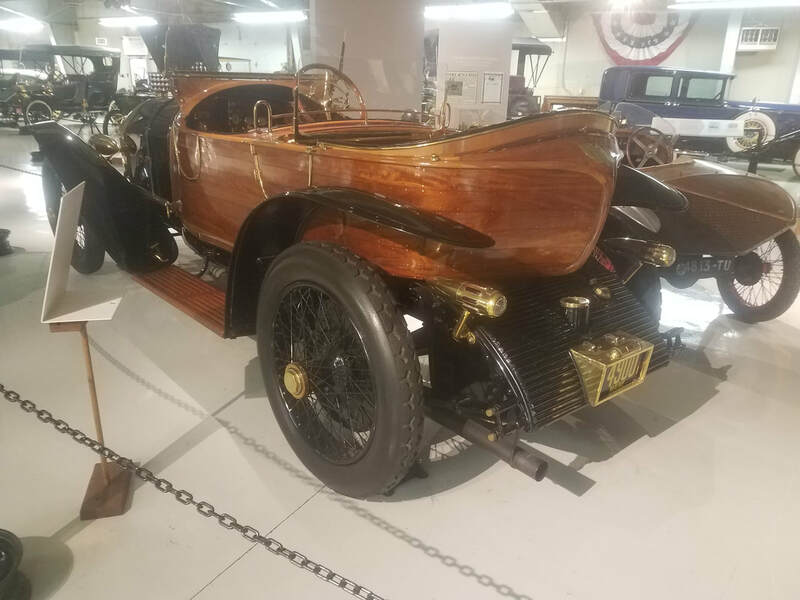 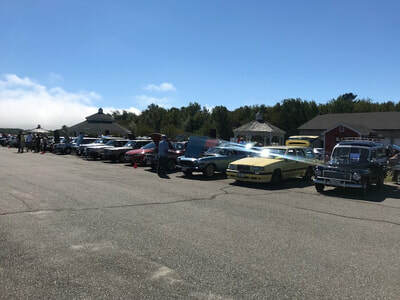 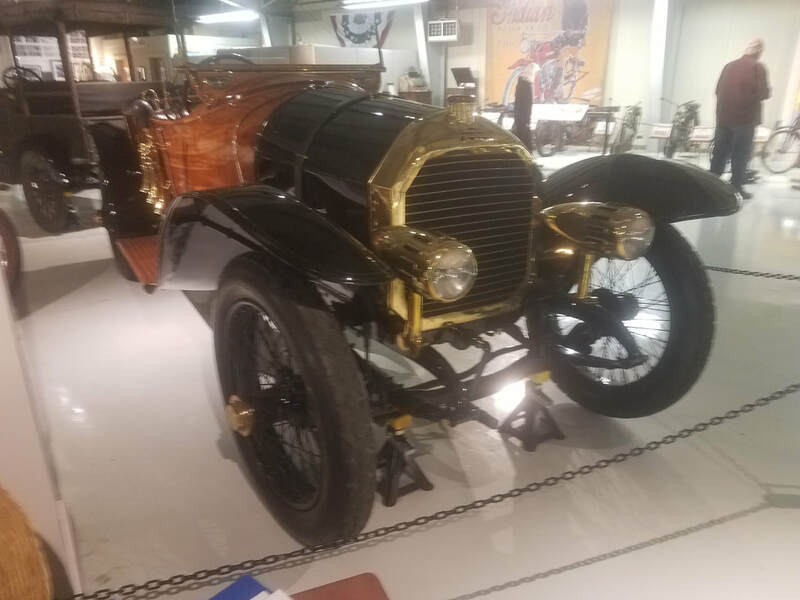 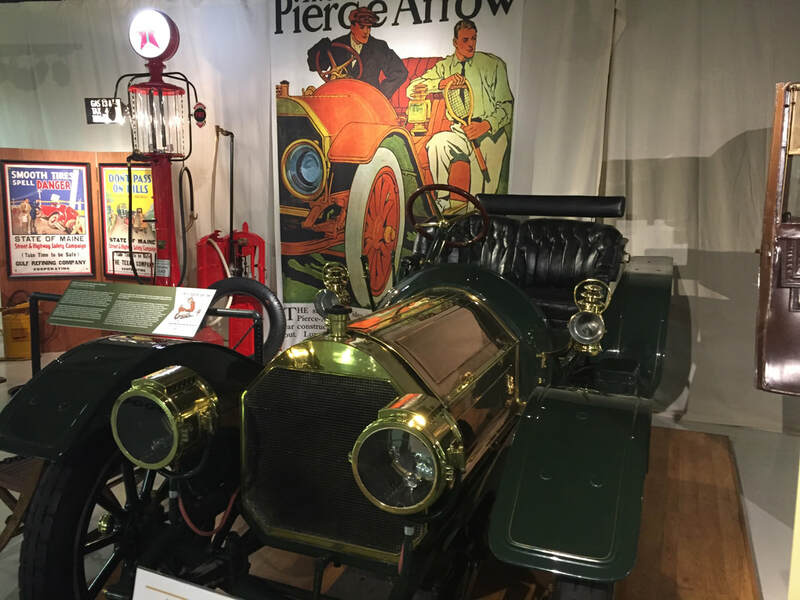 We all were genuinely impressed with their "Brass Era" collection of automobiles as many of them had a very distinguished lineage, Our last leg of the tour was a late lunch at "Govenor's" in the Maine Coast Mall just outside of Ellsworth as they accommodated our group nicely. The seemingly forever rain had stopped as we said our goodbye's. The sun was trying to peak through albeit the strong gusty winds that were starting to blow, but hey it wasn't raining!! The consensus after the tour..... and weather be dammed and of course we are going to do it again next year. 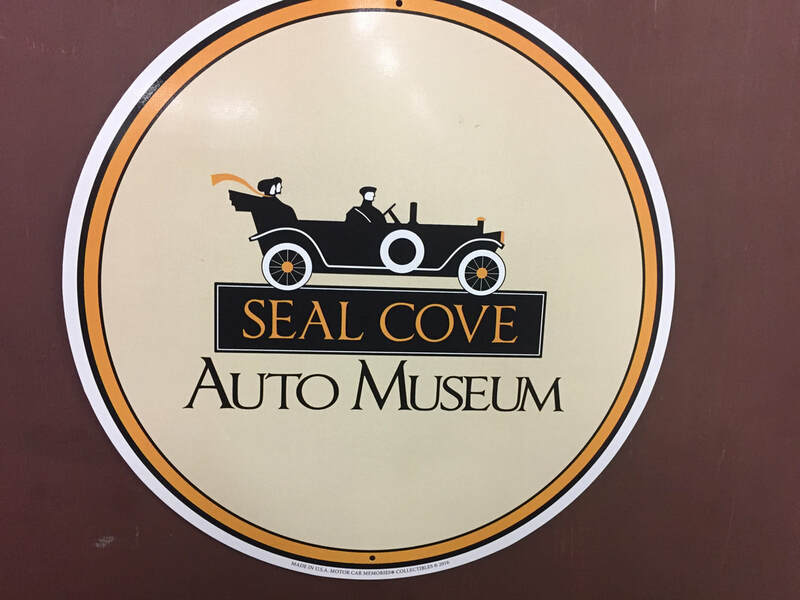 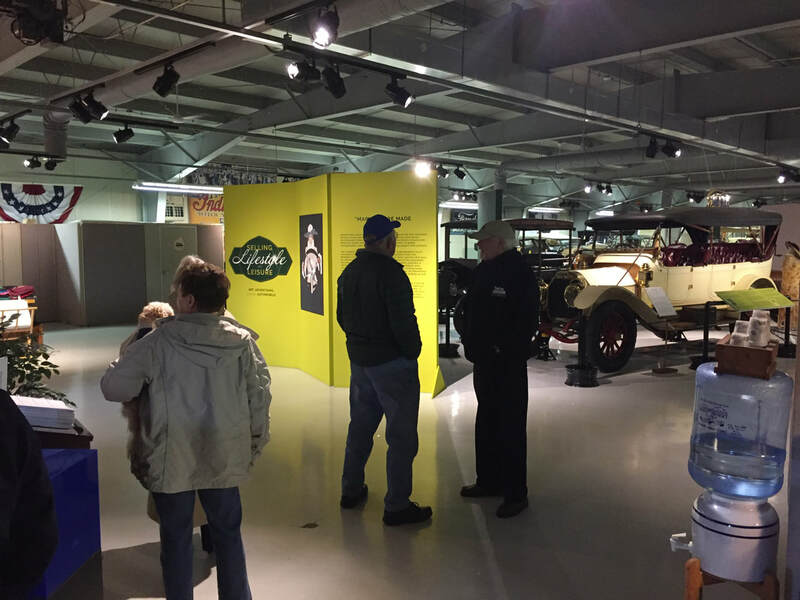 Thanks to the 10 "diehard" members who made the tour and without question to the Seal Cove Auto Museum!! 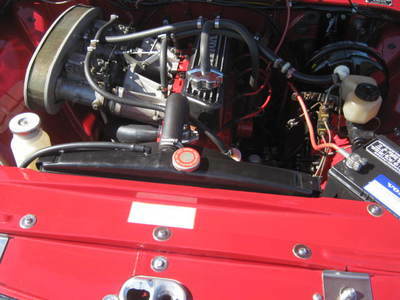 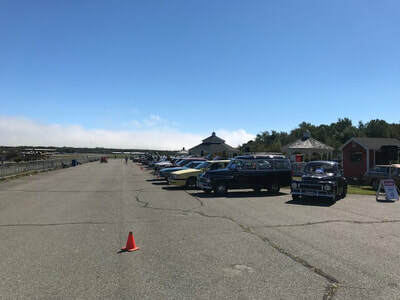 This years Foreign Car Festival started out with the weather service issuing a mid coast 'Heavy" Fog warning till 9 AM. 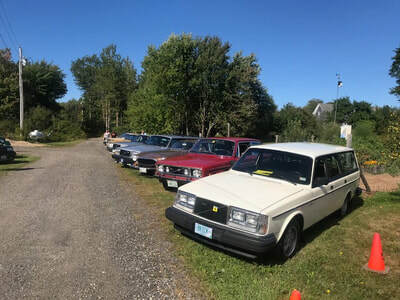 Well they were pretty much on the money and the early hours were a bit sparse in attendance, but increased in proportion to the fog's lifting.... By 10 AM the sun was out the weather was almost text book perfect and the attendance had shot up dramatically for those other "foreign makes" and more so for all sorts of Volvos. 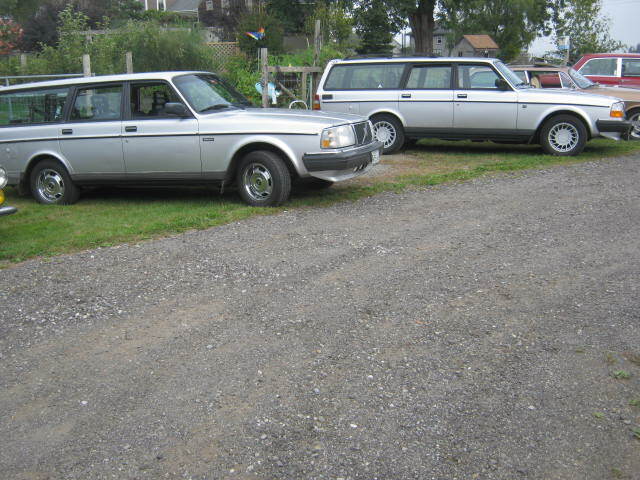 At mid-day we had 30 + or - Volvos parked in and around our chapters parking area. 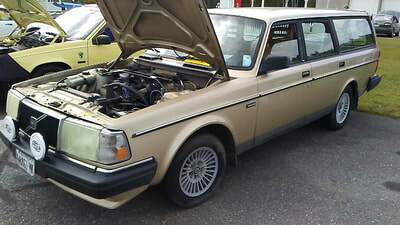 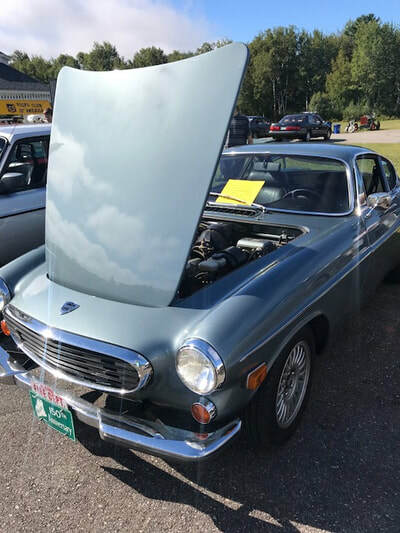 I might add we could've had another "History of Volvo" parade as there was at least one of almost every model from a PV445 to a C30 on display!!! We need to send out a special thanks to our chapter folks as well as New Hampshire and Massachusetts members for attending this spectacular event!! 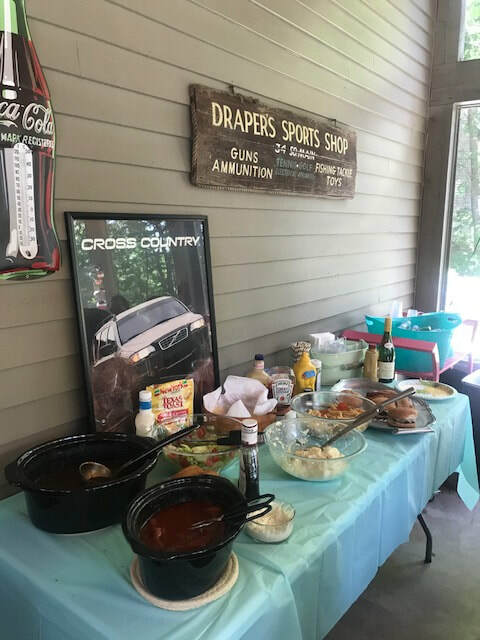 I can't thank our members without a big thank you at this event (and several others) to our photo lady Courtney Mack!! 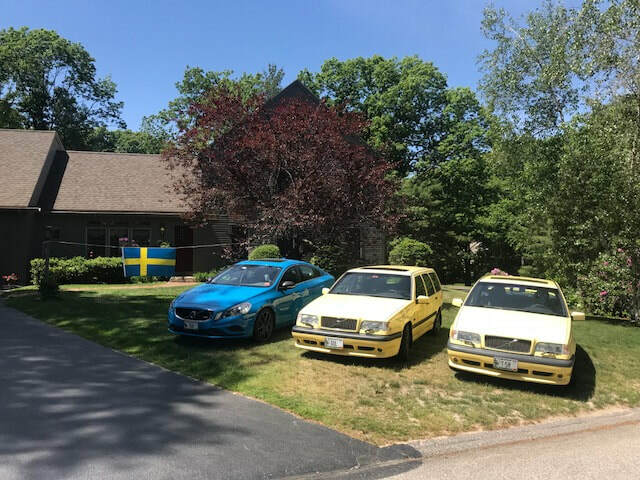 There were a few Swedish Chariots of New England folks there which made for some interesting conversations. 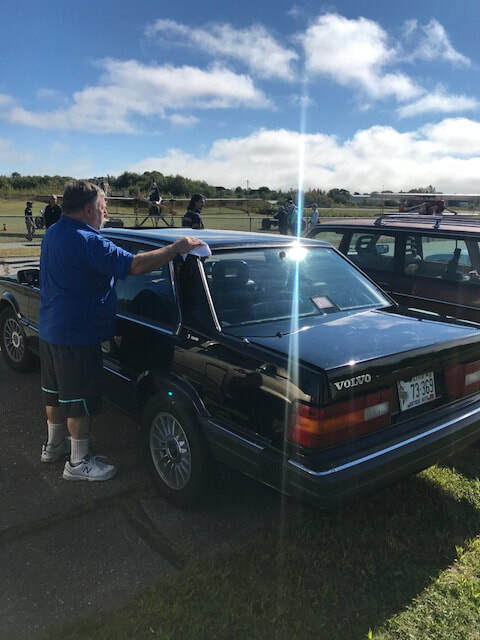 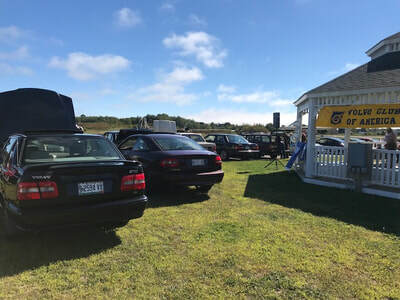 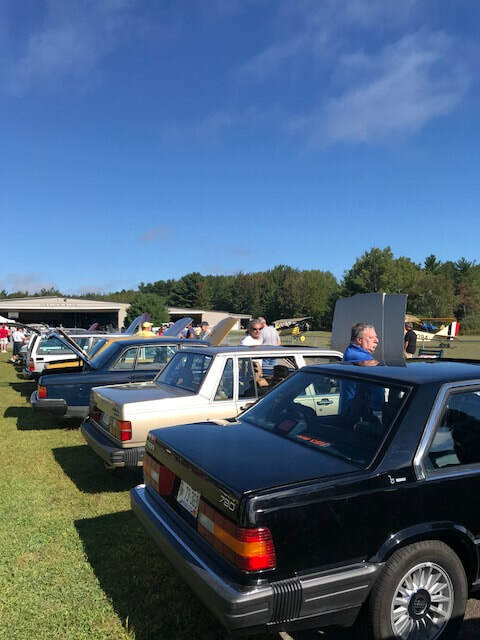 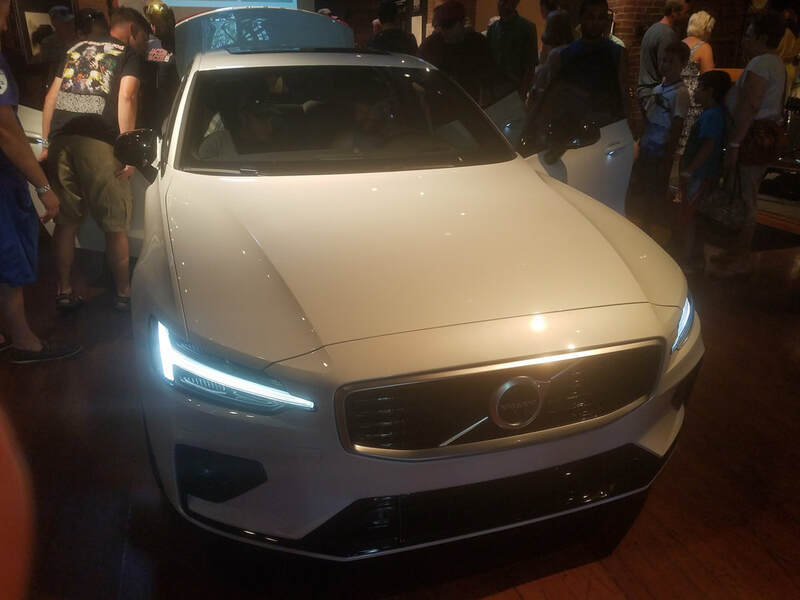 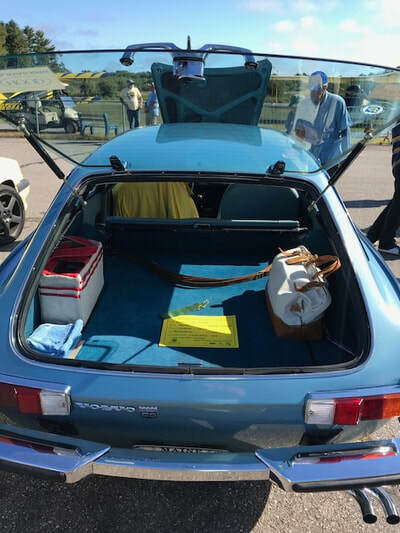 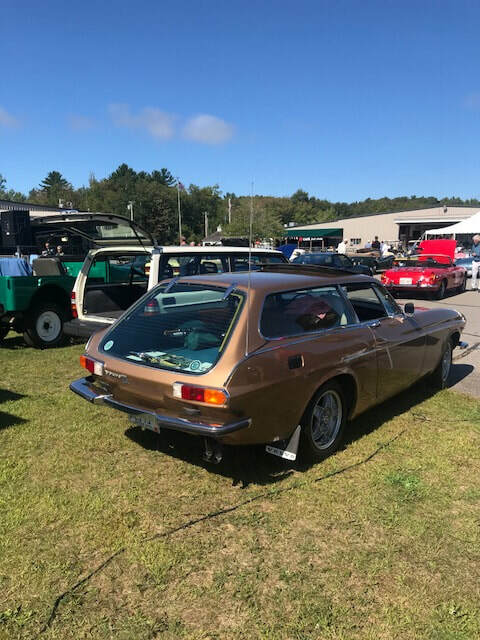 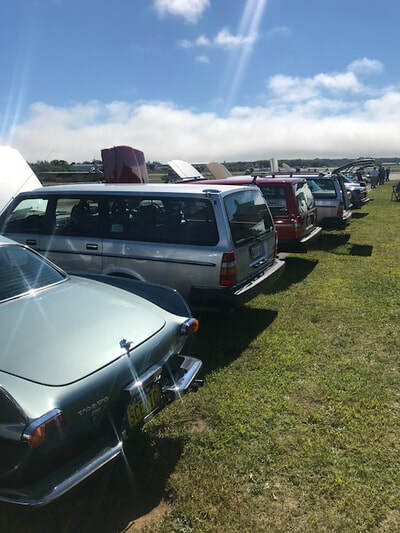 This years turn out was tremendous and along with the everyday Volvo owners who made the trek to OHTM, made us the largest gathering of any marque in attendance on Saturday!! 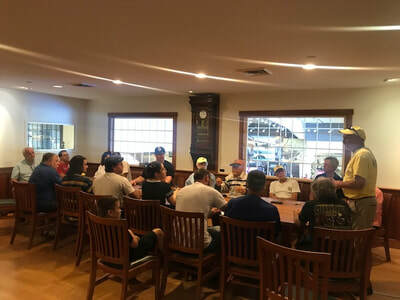 As its been in the past our monthly chapter meeting was held in the museums board room. 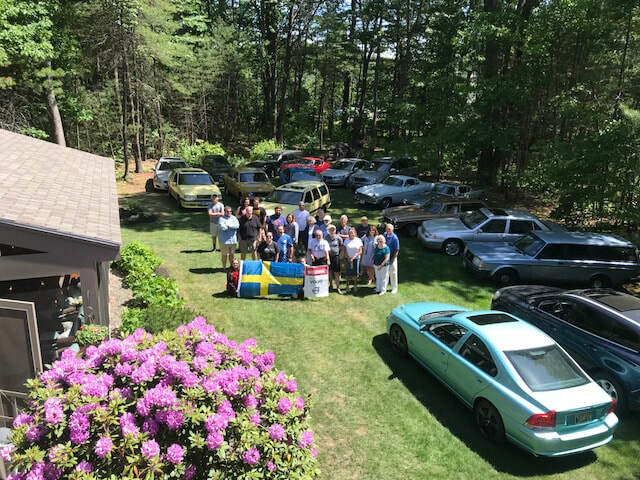 Keep in mind the gathering included the 4 chapter members from NH and Mass and all the Swedish Chariot folks who asked to tag along to see how we did things. 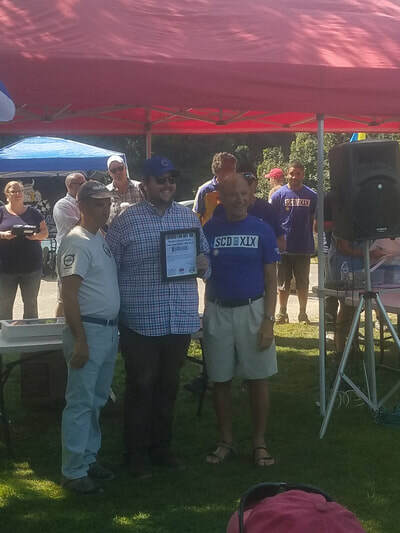 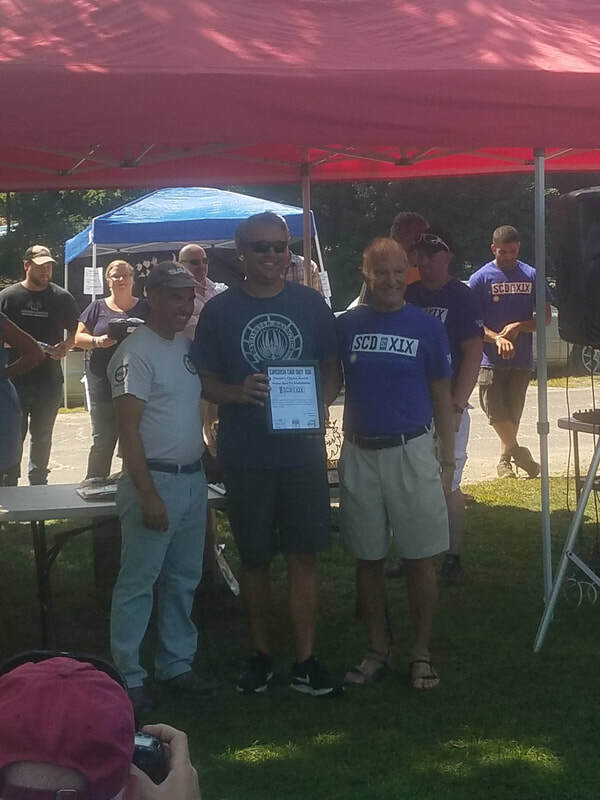 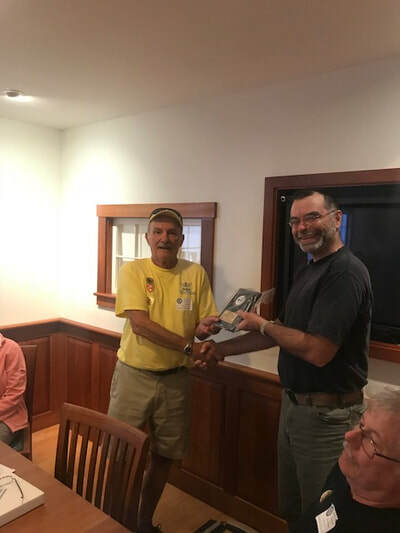 We awarded the Early RWD class plaque from our Par Sem Summer Event to Mike Silvius for his original Black 62 PV544. Saturdays Highest Mileage plaque went to a Swedish Chariots member in a Silver 89 244 that had a 5" lift and 286K on his odo. 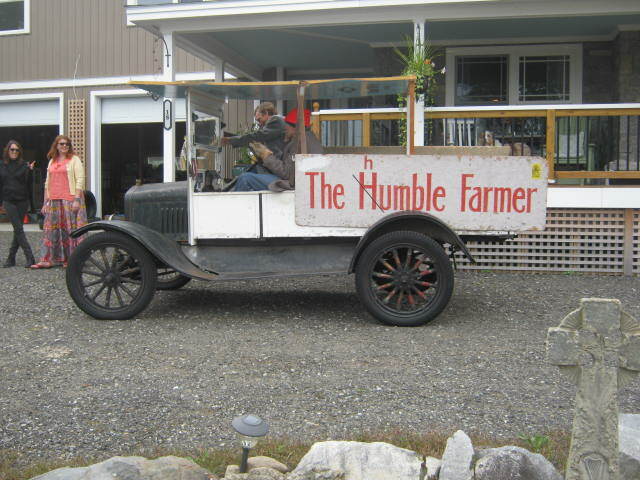 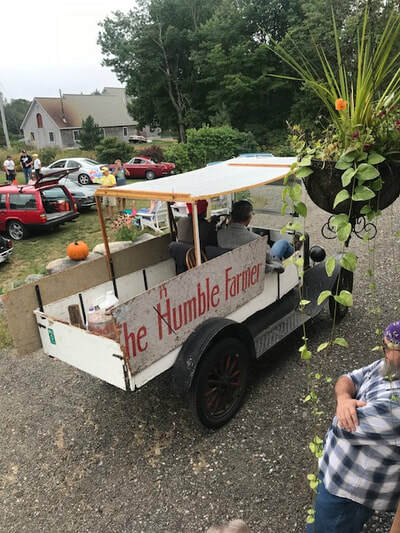 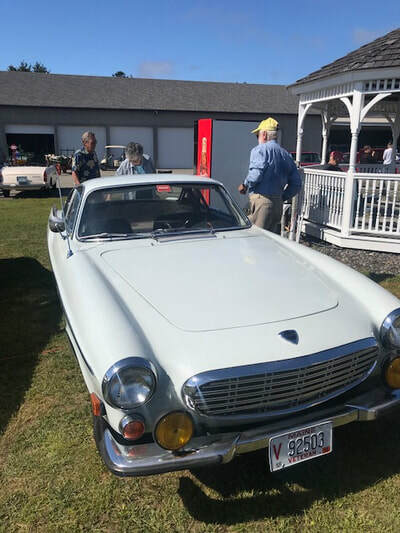 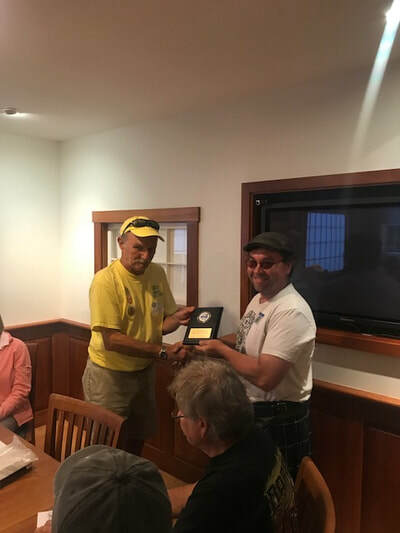 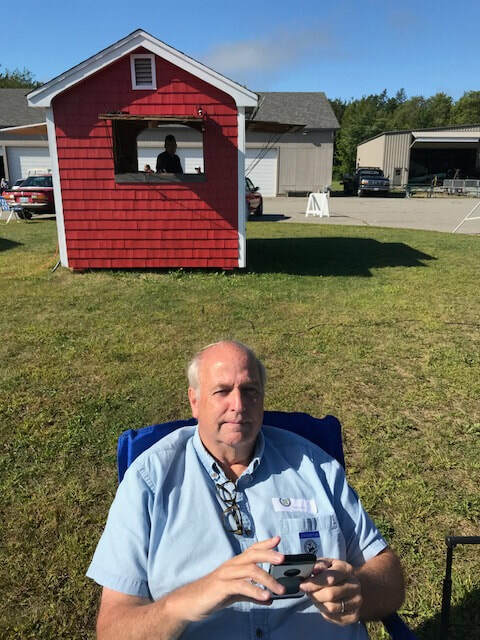 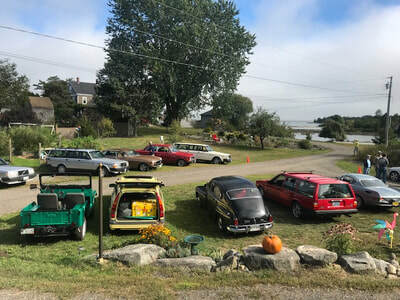 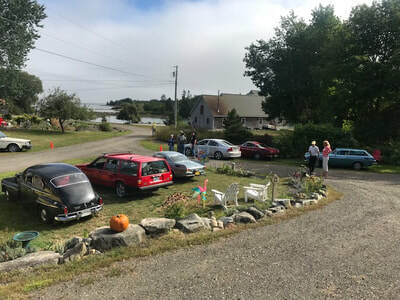 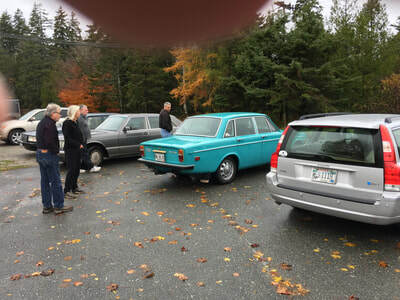 Sundays award went to Peter McCorison with a Silver 91 240 Wagon 204K (sorry we only have a pic of his car).. As for our meeting there were only a couple major items left on our docket, the National meet in Vermont at the end of September and a "Foliage Run" (to the Seal Cove Museum ?) 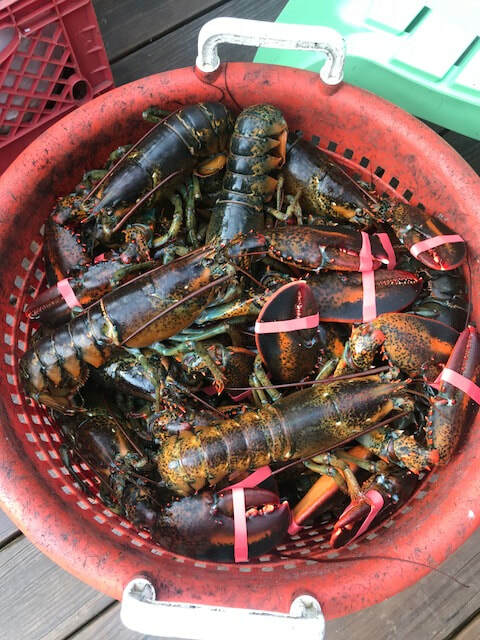 in mid to late October. 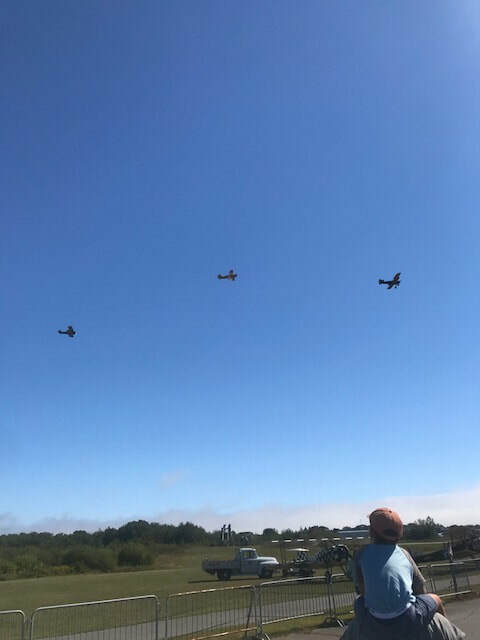 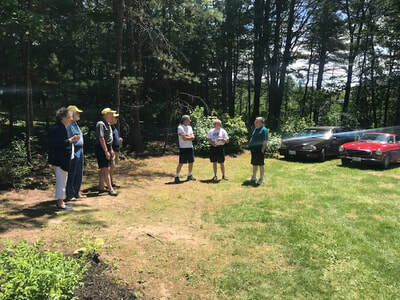 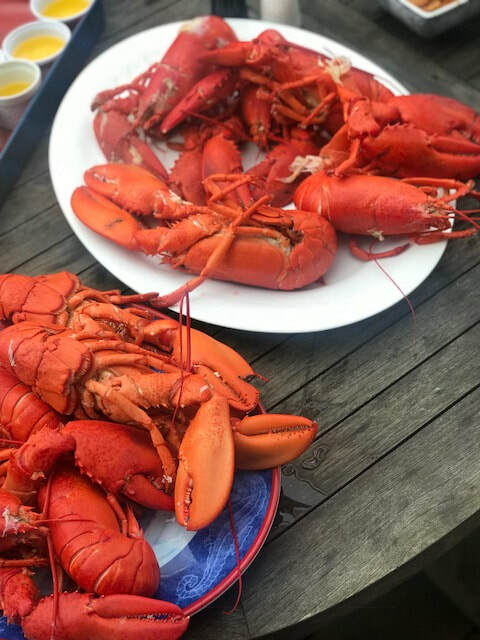 It was mentioned by a couple out of state members that the meeting was short, sweet and to the point...of course the 4th Annual Lobsters at Spruce Head was.... a mere 7 miles "up the road" and scheduled for an hour from then !! 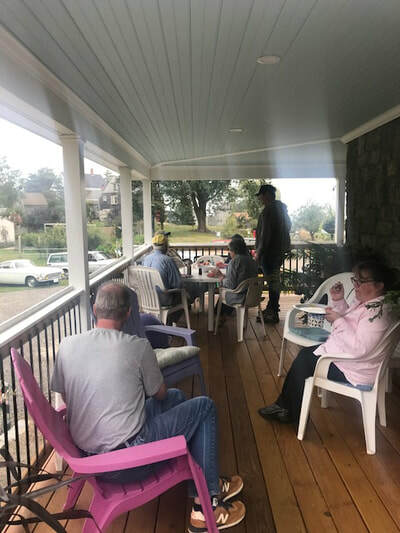 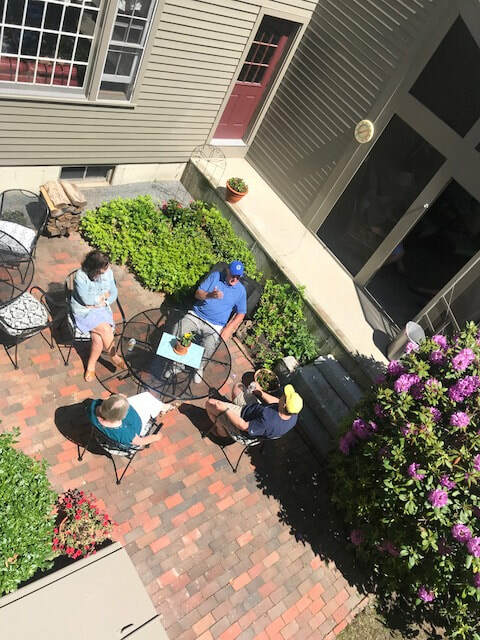 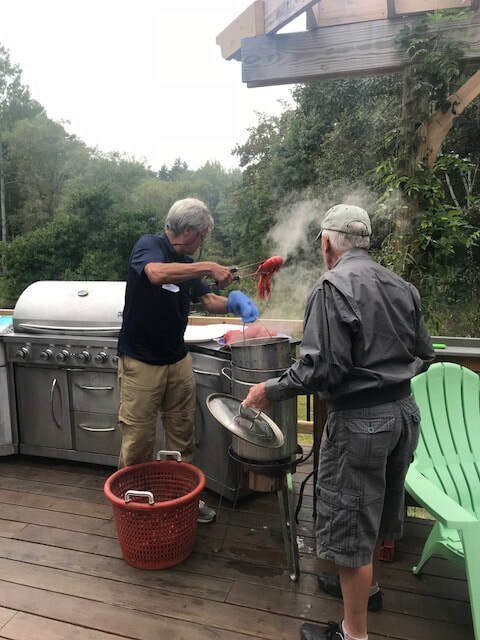 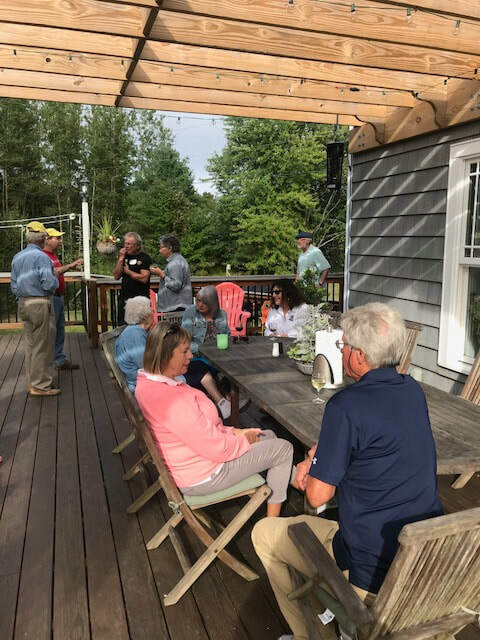 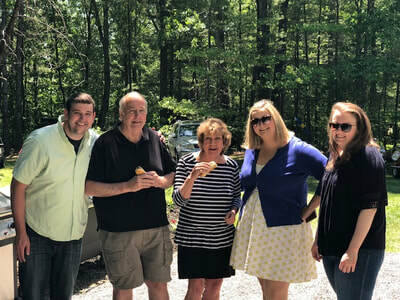 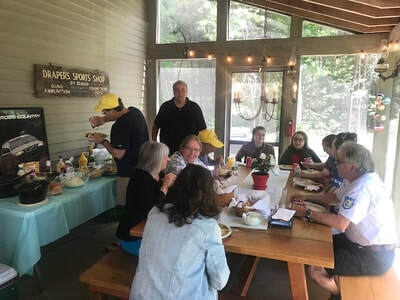 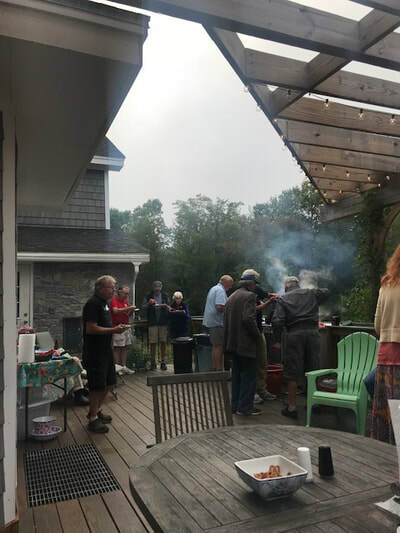 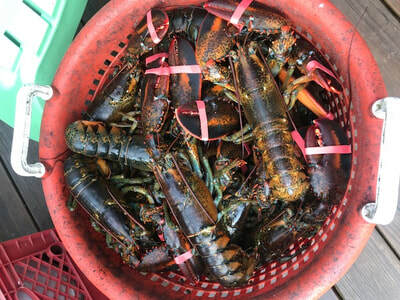 Our fourth annual Lobster (or Chicken) Cookout was held in Spruce Head at the home of Naomi Howe and Duncan Labay. 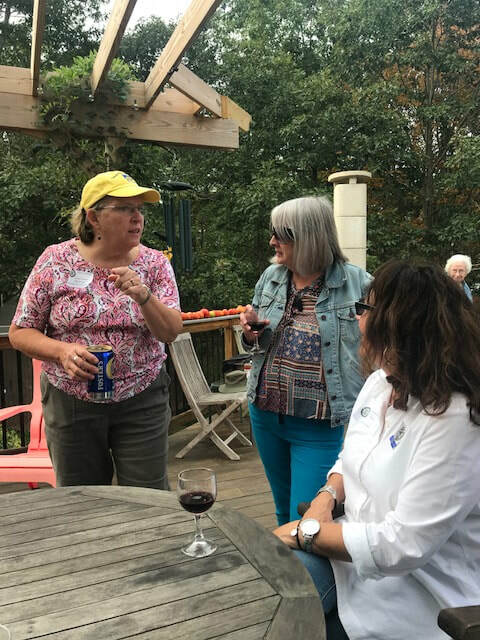 Both those names should be at least familiar as Naomi is a longtime contribuitng member and Duncan is the (last) Founding Member. 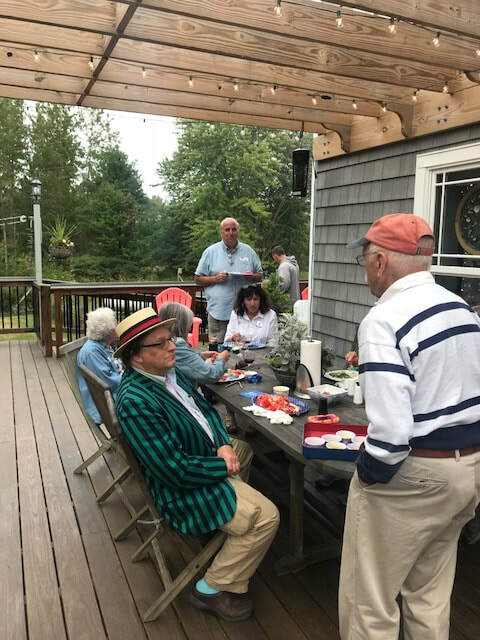 Its always a genuine pleasure to visit Naomi & Duncan in Spruce Head every year and as for the cookout it always boarders on phenomenal and I've never spoken with anyone who doesn't agree!! 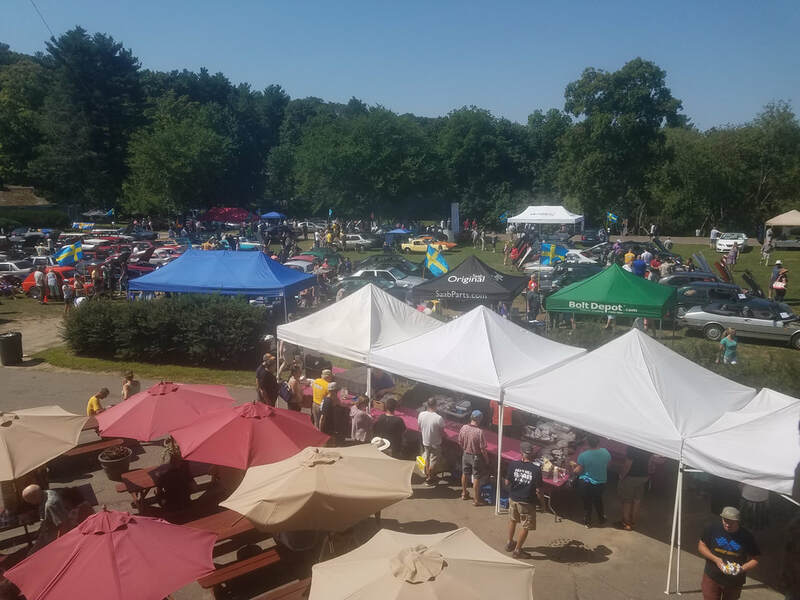 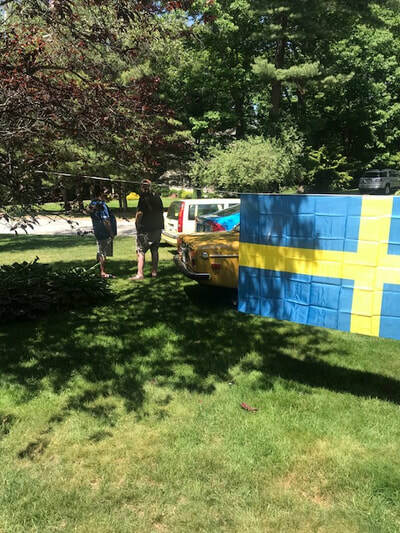 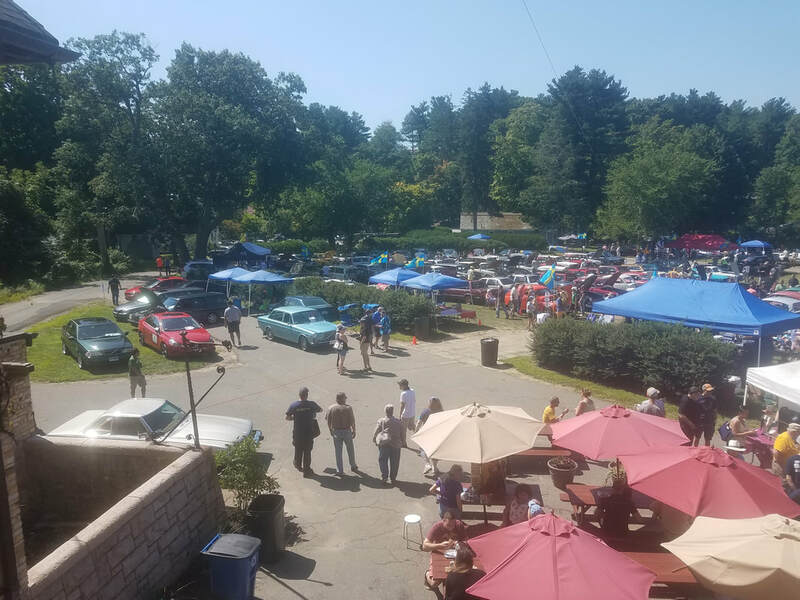 The 19th Annual Swedish Car Day was held in Brookline Mass at the Larz Anderson Museum on a beautiful bright sunny day, no humidity and about perfect for a large gathering of Swedish vehicles!! 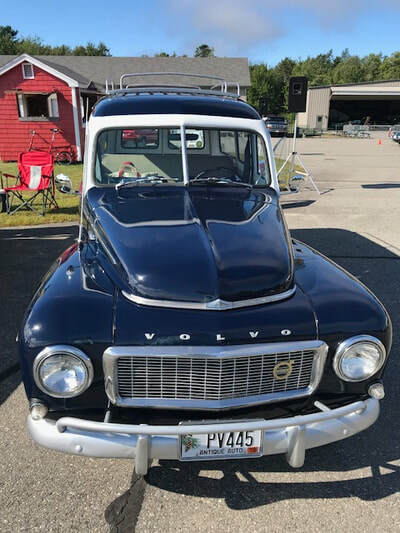 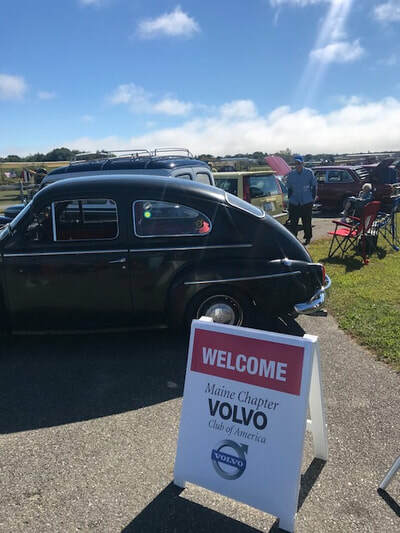 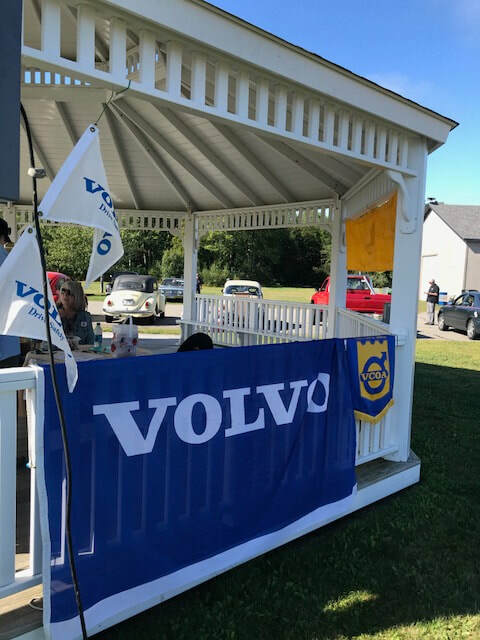 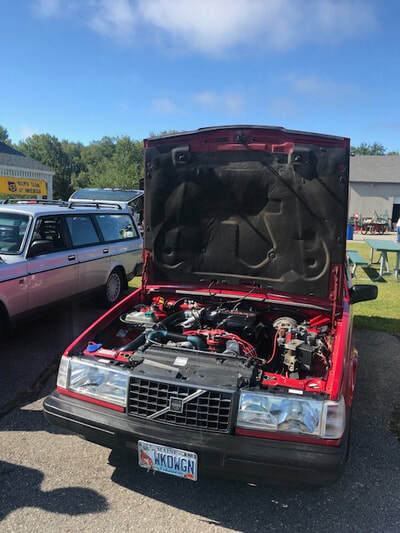 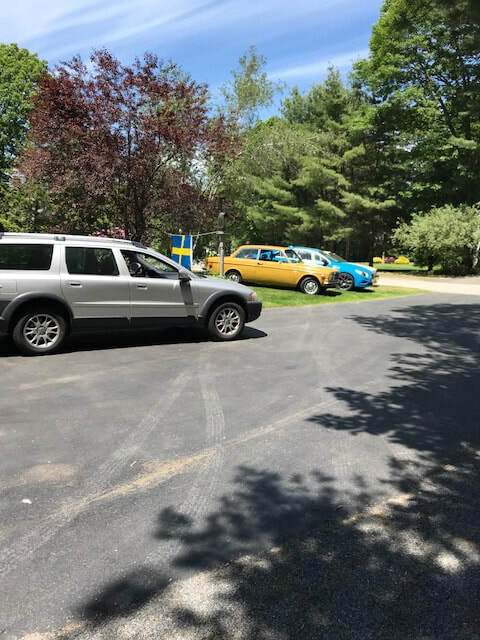 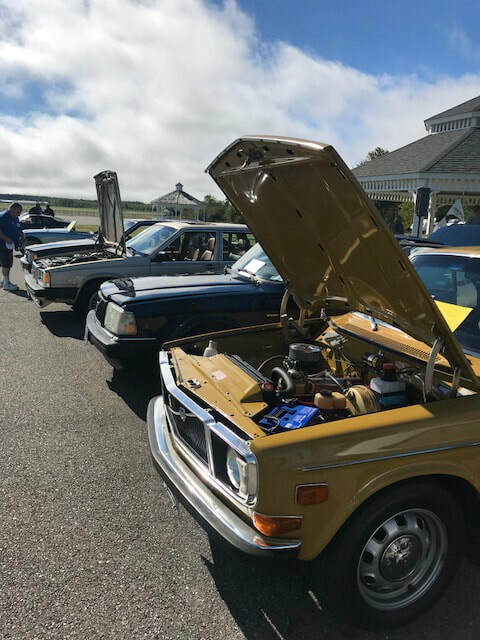 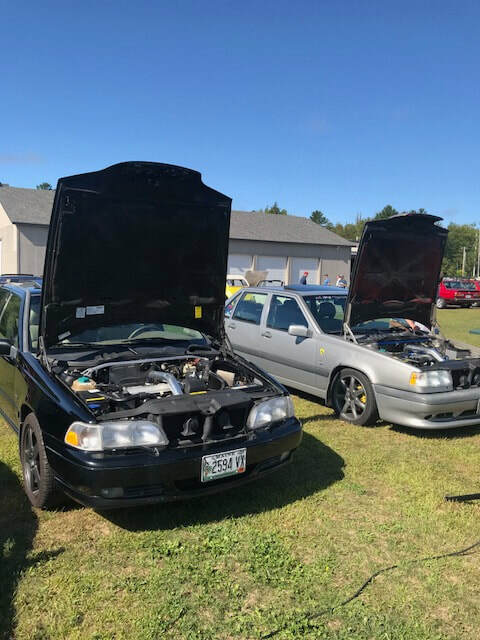 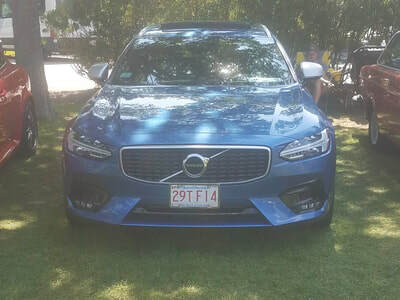 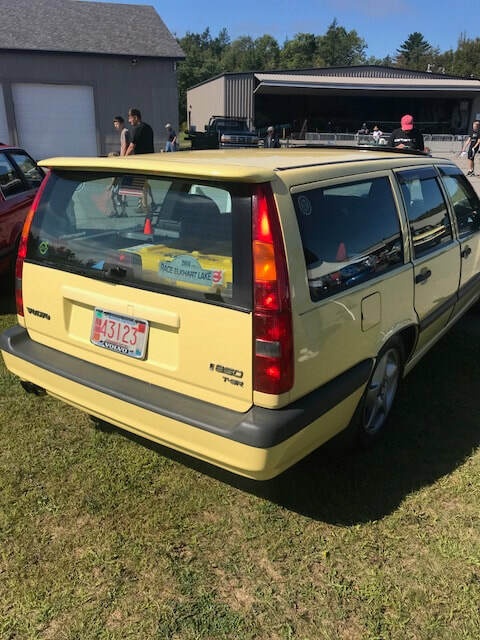 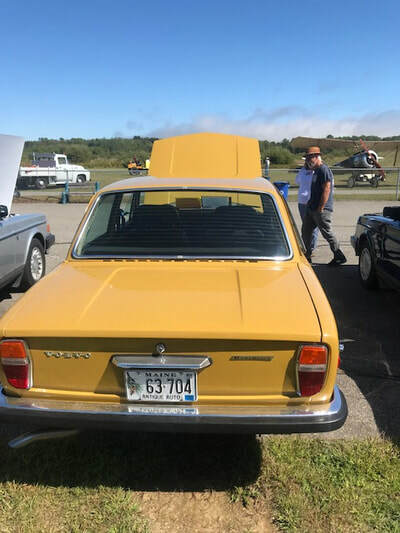 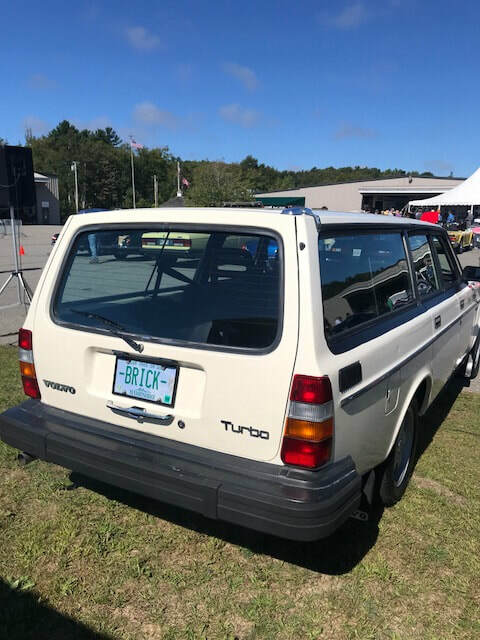 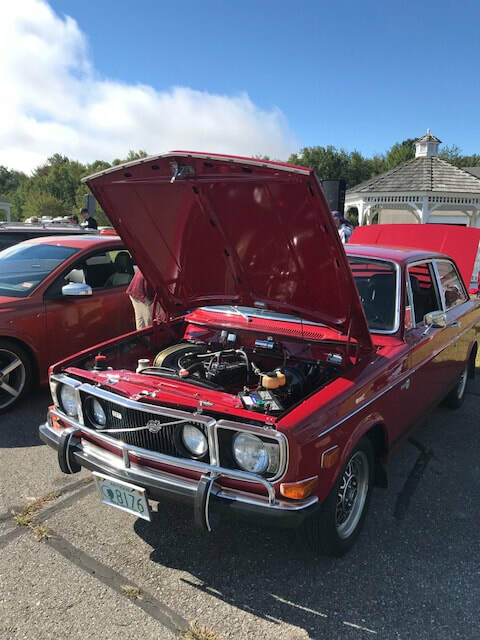 Four Maine Chapter members volunteered to park (Volvo) vehicles at this years event and it was a good experience for all of us. 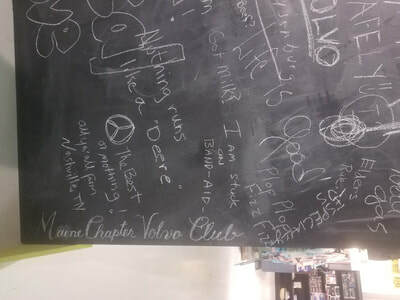 I'm guessing our chapter participation at 6 and they all were smiling whenever I caught up with them during the event. 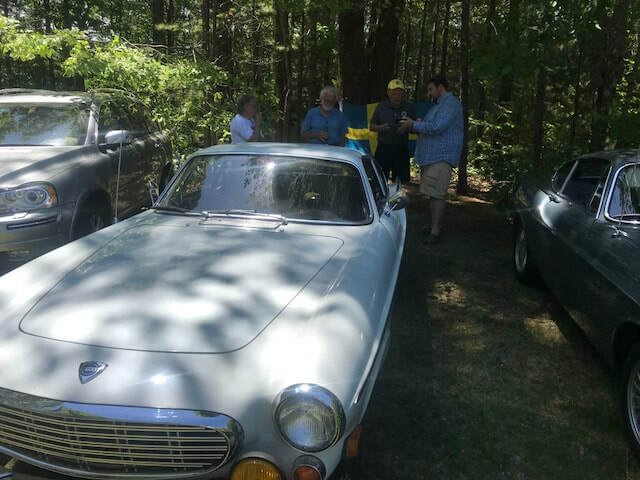 Two of them in particular were smiling even more broadly when there vehicles won in their respective classes. 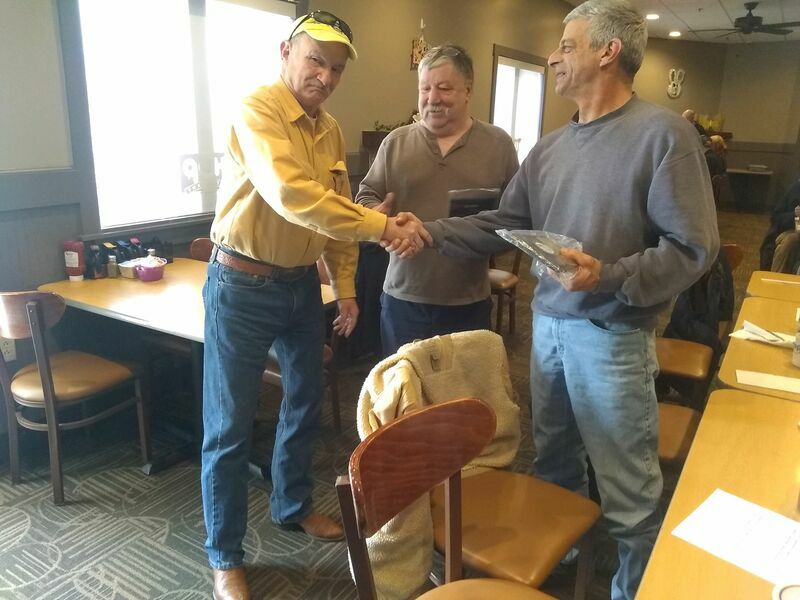 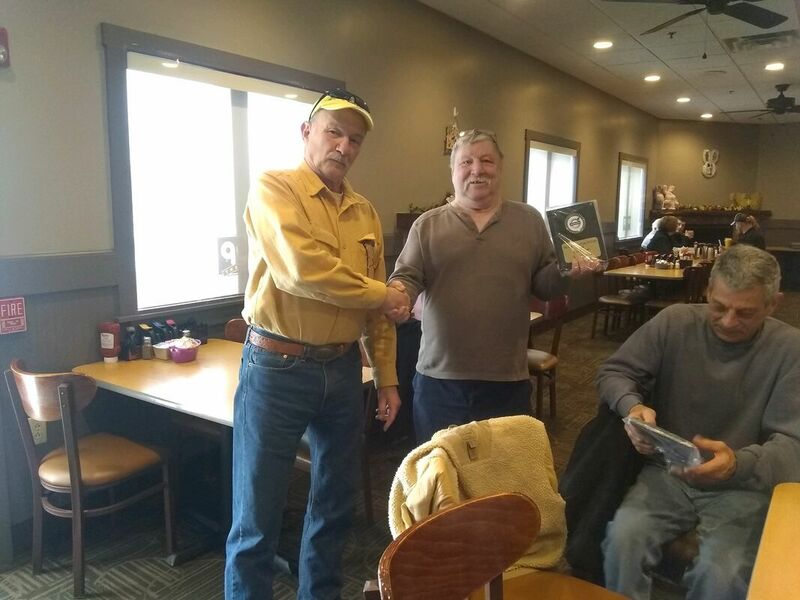 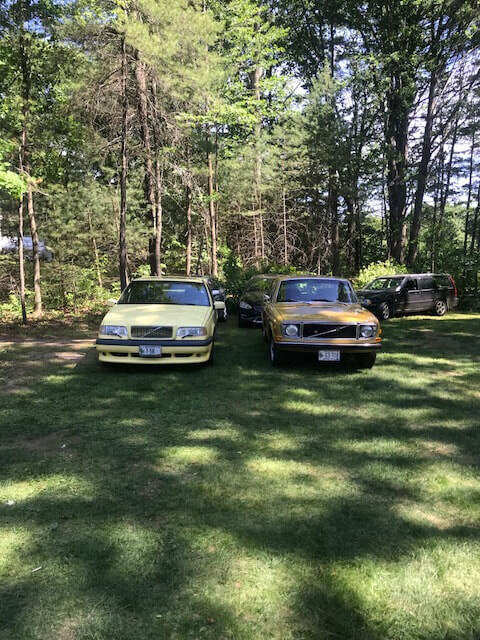 Congratulations go out to Colin Mack and his Yellow 855 T-5R, along with David Moore (twice) with his modified 940 Wagon w/5.0 Ford V-8 and his 1962 444 . I can't speak for everyone but I think our Chapter was pretty well represented and we all are looking forward to next years event. 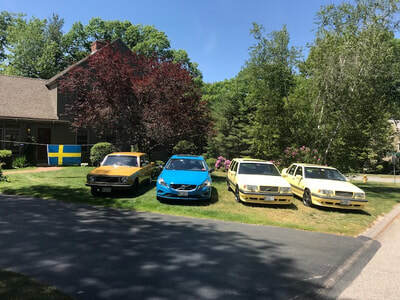 Included are just a few pics that I took, there are numerous others on Facebook, search for Swedish Car Day. Welcome to our Volvo Site. 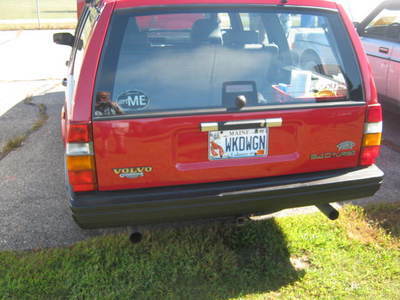 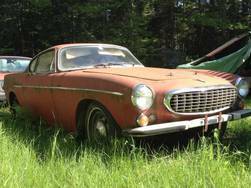 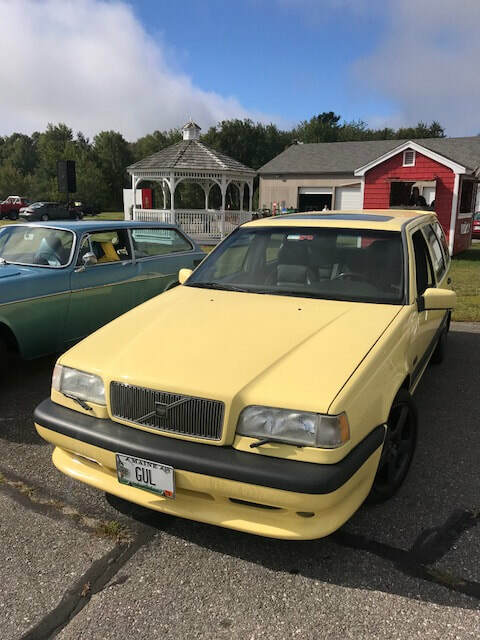 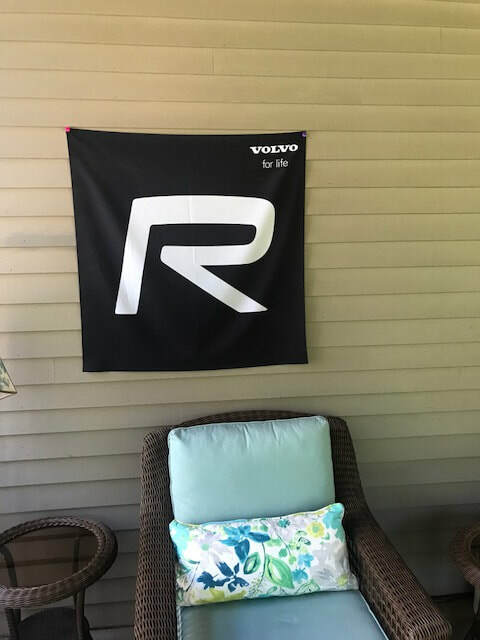 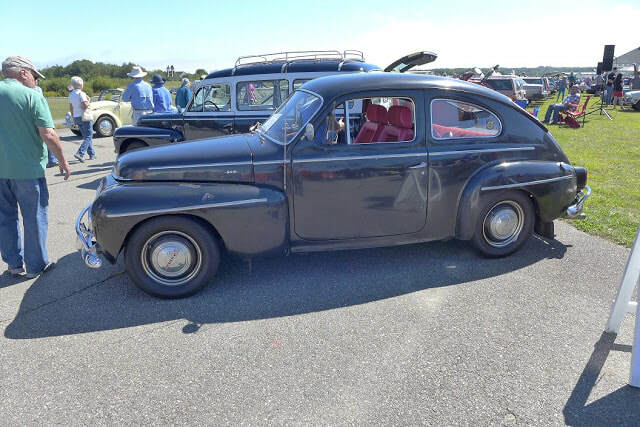 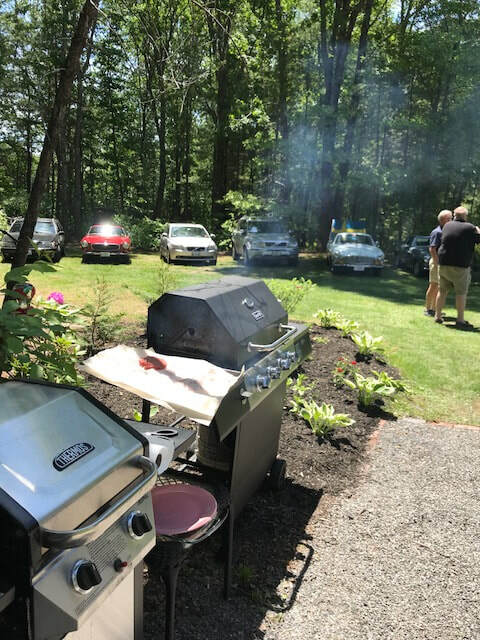 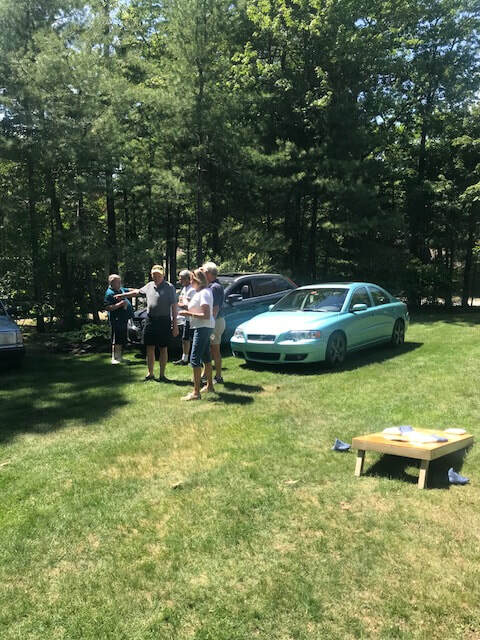 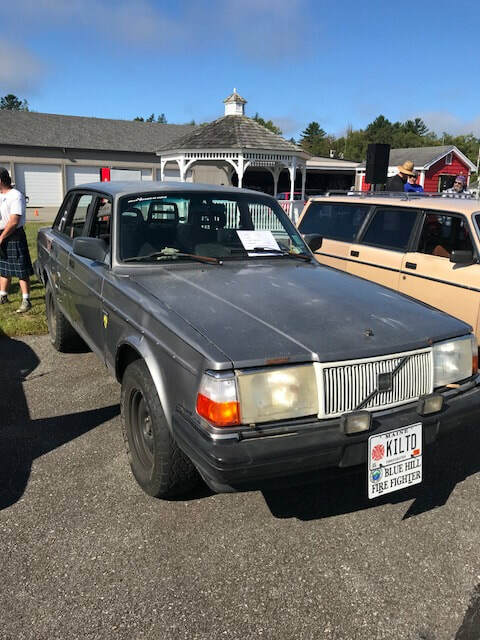 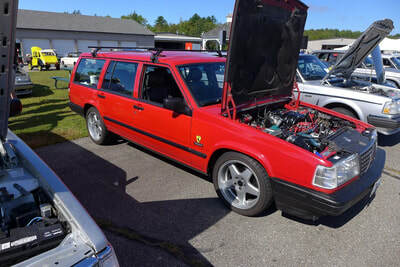 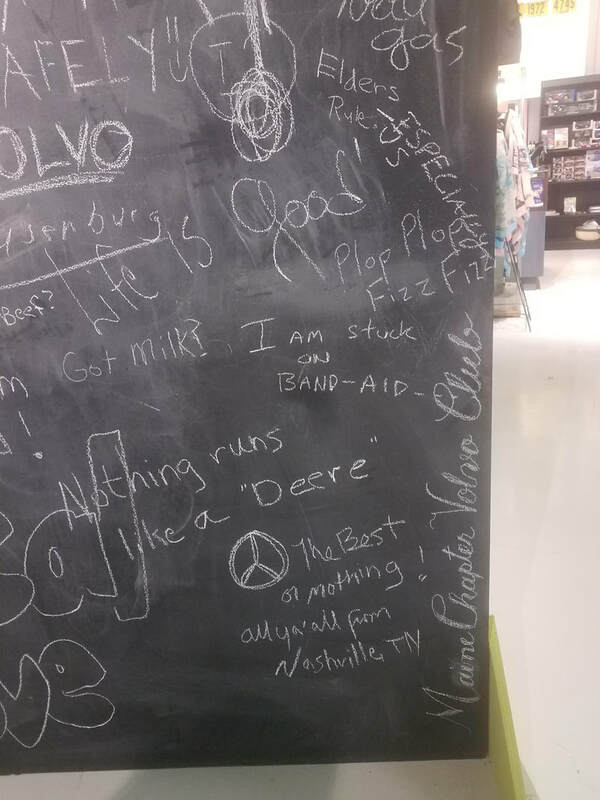 We are a group of "Volvo"
​ aficionados living in Maine! 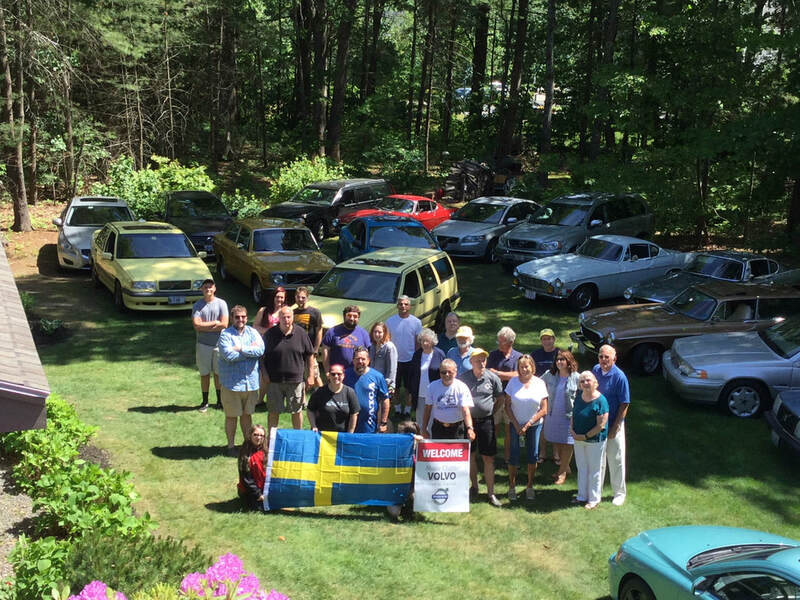 Our Chapter is an official Chapter of the Volvo Club of America. 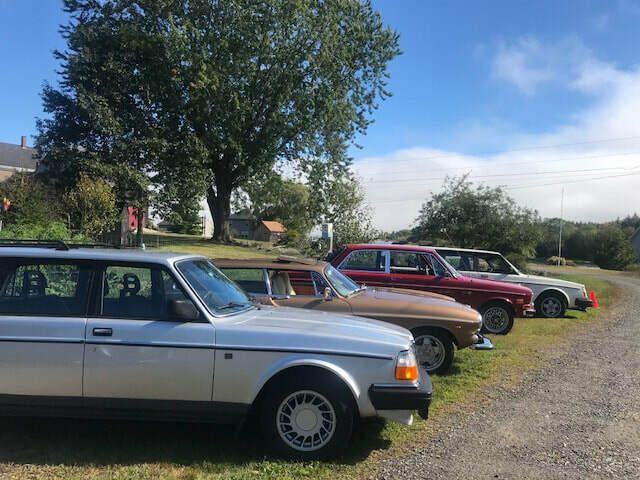 "Vintage" Volvo owners or newer, all are welcome! 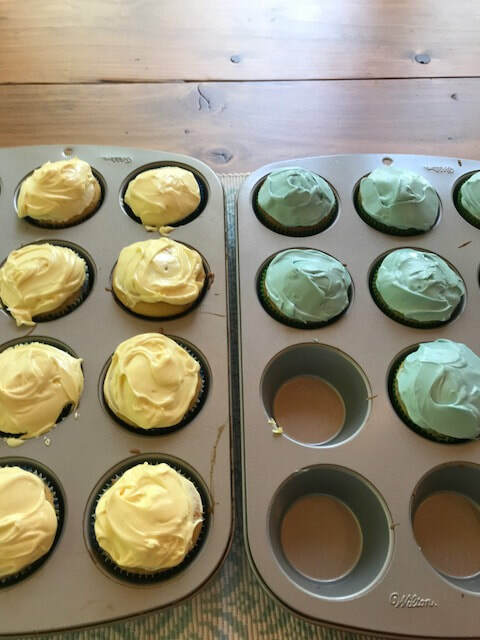 Click on the P1800 photo below to learn more about our next "Event"